Dual speed floor buffers are good all-purpose machines. The lower speeds can be used for tough lower-speed scrubbing jobs, and the higher speeds can be used for lighter scrubbing jobs. The higher speed settings can occasionally be used for light floor buffing, although this is not their primary use. 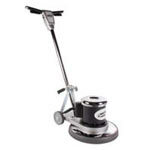 We have 2 sizes to pick from: 17" floor polishers, and 20" floor machines.